Description: NS 9578 with fire damage to long hood . Was on CS 161 last weekend. Title: NS 9578 with fire damage . Description: NS 9578 with fire damage to long hood . Description: NS 155 is crossing over the Military Street bridge as it passes the site of the National Cemetary on Memorial Day 2005. Description: A scorched Dash-9 leads an old conrail dash-8! Hmm, I wonder how the dash-9 got scorched? Description: NS #11J westbound at Redington @ 12:27 hrs. Description: CP 168 crosses Harpursville Trestle. Description: The yard crew brings her along side the station for the road crew. Description: The road crew now prepares to take this train north. Title: NS 9578 with ICE! Description: After pulling foward a few yards, they stopped and the conductor climbed off. A few seconds later he's seen here carrying a bag of ice. The engineer seems interested in something in the front. Title: "We have ice......now we're ready"
Description: Gaining speed as she climbs the grade north out of the yard. The tracks and road parallel the Shenandoah River along this stretch.....its beautiful along here! 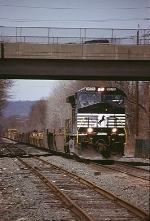 Title: NS 9578 heads north towards Stanley,VA. Description: I heard that it hit a garbage truck somewhere near the St. Charles , St. Peters area ? Title: NS 9578 Hit a garbage truck sometime during the night or the day before. Description: 144 heads north on the Marion Branch at 18th Street.